A CLAUSTROPHOBIC, unrelenting, tense, but maybe slightly unrealistic take on a tired formula, Whiplash is still gaining Oscar buzz week on week. It is hard to tell where this movie, about a student in a prestigious music school in New York who clashes with a brilliant, but tough, teacher, subverts the clichés and becomes a legitimately great and unique movie. The 29-year-old writer/director Damien Chazelle has just done two feature films before this but it is clear he has a big future. Andrew Neiman is a talented but raw first year student at a prestigious music school. In the film’s opening scene he is overheard practising by Terrence Fletcher, a well known jazz teacher. He surprises Neiman by inviting him to sit as an alternate drummer in the university’s jazz band. Two minutes into the first rehearsal we see what kind of teacher Fletcher is - a bully, an old school teacher who believes in beating the talent out of his students, insulting their parents, their sexuality, and their intelligence, sometimes in one sentence. Neiman does his best to accept his challenge doing anything he can for his praise but begins to learn there is no pleasing Fletcher. JK Simmons, who plays Fletcher, is one of those “I know that guy” actors. He’s always been really good, particularly in HBO’s OZ where he played leader of a neo-Nazi gang in an American prison. He played that role with such venom and anger, that watching him play the avuncular father in Juno or I Love You, Man, makes you wonder how it can be the same actor. Fletcher’s intensity sets the tone of the film, he speaks with a fast, harsh, rhythm, with a sharp, blasting, vocabulary of incredibly obscene insults and creative swear words, making Malcolm Tucker look like Angela Lansbury. The way he whips his hands and says “Not my tempo” is as punishing as his slaps or humiliating verbal abuse. We are not rooting for his students to get up and leave but to get it right and prove him wrong - which is what Fletcher wants too. A very clever performance, I see him walking away with the best supporting actor award. Thankfully Miles Teller, who plays Neiman, is more than a match for Simmons, proving his great performance in The Spectacular Now was no fluke. He has remarkable depth for someone so young and we do not need close-ups of the calluses on his hands or a montage of late night study to see his struggle. As he changes throughout the film, for better and worse, Teller retains our sympathy but still draws our criticism. It is a more complex role than it first appears. This might turn out to be my favourite film of 2015. It has, perhaps, an unrealistic final fifth, but that is easy to forgive after what it puts you through for the first hour and a half. I love its pace and energy. It asks serious questions about teaching and parenting and does not really offer easy answers, especially considering it comes from such a young mind. 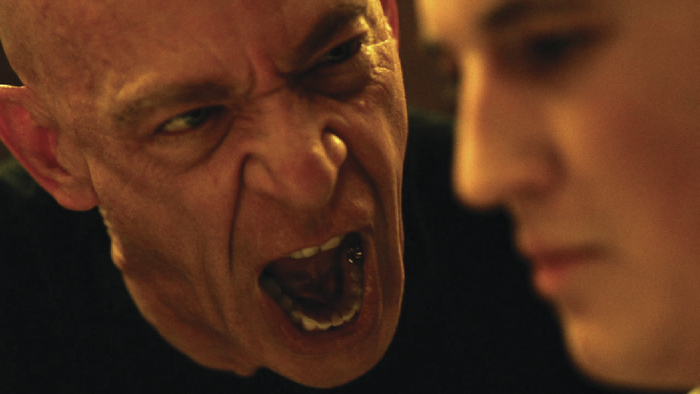 Whiplash is a film you come out of just wanting to exhale, you want to discuss it, you want buy the soundtrack. Despite its small cast this is a movie for the cinema. Go see it now.